One evening while admiring my stunning new cadmium red leather, triple strapped tango shoes with the saucy leather rosette and the wide copa heel that harkens back to the Golden Age of tango, my dance partner asked me if since I’d been dancing the Argentine tango, had I developed a new appreciation for shoes? What shoeless planet was he from? How naïve! Did he know any women? 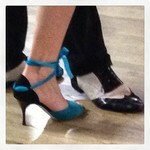 I told him that many of us ladies choose to dance the Argentine tango because of the shoes. If you see us seated on the sidelines at a milonga, engaged in serous yet lively conversation with much finger pointing in the direction of the dance floor, chances are we’re not talking about the parade of dashing leads. We’re talking tango shoes. So let me ruminate on this entirely uplifting topic. I’m talking high heels. We’ve heard ad nauseam that it takes two to tango. I’d like to propose that with the addition of a pair of stunning tango shoes, it takes three. Women’s love affair with shoes has been well documented. Among the many reasons for our deep devotion is how they make us feel. While self-worth, income, weight and age tend to be in a constant state of flux, the one metric that I can generally count on to not go kaflooey is my shoe size. If a pair of shoes doesn’t fit, I don’t suffer from the same plummeting confidence as when squeezing into a pair of jeans and then having to admit defeat. A great pair of shoes can change my mood the instant I step into them. And on the dance floor an exquisite pair of sparkly ankle strapped stilettos can transform even the most uninspired of tango get-ups. We’ve all seen the evidence of the benefits of wearing high heels: the elongated leg line, the arched foot and the all-important lifted and well-formed derriere. While I value elegance from the added height (and who doesn’t like a well-toned muscular calf), I also place a high value on being able to run from oncoming traffic. On the street I may not choose to walk in them, but on the dance floor I sure can dance in them. Aside from being things of beauty, heels are part of our equipment. They help to offset the slightly forward lean of the tango posture. As tools of the trade, tango shoes differ from others by being more flexible and having well-secured and balanced heels. One of the aspects that make tango look like tango is the expressiveness of our feet by way of flourishes–known as embellishments. These are the movements that can add that little something extra as part of our collaboration with our partner. They may be as innocent as simply toe tapping the floor or as seductive as gently caressing myself, or my partner with my leg–or my shoe. Since we’re doing all this dance-floor flirting with our feet, why not step it up and flaunt a pair of fabulous shoes? Whether we slip on a pair of gold-encrusted four-inch stilettos or we buckle up our black and white spectator-peep-toes with a two-inch Louis heel, we have endless, exquisite possibilities of how to show our individuality even while listening to what our metatarsals are telling us. Oh, but how then to choose? There is much discussion among tangueras about the various shoe options, leather soles versus suede soles, sling-backs or closed heel cage and the most heated of them all, stilettos versus thicker heels. While these are all deeply personal preferences, on a crowded dance floor, when we’re kicking up our heels, the difference between stilettos and a thicker heel is that of a puncture wound versus blunt force trauma. I suspect that half the reason for taking a trip to Buenos Aires is to go shoe shopping, though there are plenty of other ways to secure a pair or three of these beauties. In New York, we now have our very own tango shoe shop: La Mina Tango Boutique. It’s just down the hall from the Foxy Fitness & Pole Dancing School. There are also online shoe stores like Mr. Tango Shoes. You can choose from their off-the-rack offerings or have a unique pair custom-made by choosing from their mix-and-match menu of styles, colors, heel heights and heel shapes. Or, if you’re overwhelmed and paralyzed by too much choice, an enterprising tanguera, Mari Johnson has reimagined Mr. 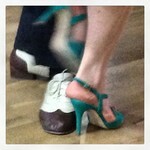 Tango Shoes and dreamt up her own combinations. She has done what I consider a public service. Sometimes these entrepreneurial shoe peddlers come to us and set up shop at a milonga—practically on the dance floor. Some of the most distracted and disconnected dances I’ve ever had are when my partner inadvertently danced me by one of these impromptu shoe displays. Like the time I had my eye on a pair of gold-heeled, parrot green, patent leather sling-backs and I could not wait for the song to end. For this, gentlemen, I am truly sorry. While men may not be as easily diverted by all this shoe mania—they do have a thing or two to say about dance floor footwear—theirs and ours. One partner remarked: “You know Nancy, men strive for individuality too.” He went on to tell me about how he meticulously duct-tapes the soles of his Pumas to give them that extra spin. Another said he was compelled to move toward shiny, sparkly things, especially when strapped to a woman’s arched and pointed foot. The most heartening of all is that some men are not completely blinded by all the glamour. They look at a woman’s shoes to see how worn they are, with the telltale wear and tear being the mark of an experienced dancer. Putting all the admiration of others aside, simply put; we love shoes, and dancing tango gives us seven nights a week to love them even more. So, at times when I can’t sleep as I despair at my own economics or I’m at a loss as to what to do about the latest destabilized country, the decimation of tigers or my dog’s inoperable tumor, I take a short break from it all and do a little Web window-shopping for tango shoes. While I know that the desire of things does not happiness bring, in that half hour or so, I am perfectly happy. With styles such as The Goddess and Seductora, that come in vermilion, emerald green, peacock blue and radiant orchid, I know I’ve stepped way out of my Birkenstocks and into the vibrant world of the Argentine tango.